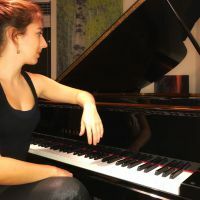 Additional Info: I'm an International performer, charmber music and piano teacher with a wide repertoire of international awards and performances around the world. I'm also a highly experienced instrumental/vocal accompanist. Born in Barcelona, Spain, I began studying piano at the age of 3 with my mother, herself a pianist. I pursued my studies with prestigious Russian pianist Leonid Sintsev from Saint Petersburg Conservatory and also with Oxana Yablonskaya from Juilliard School in NY. At the age of 21 I already hold three Bachelor’s degrees: Piano, Collaborative Piano –Chamber Music- and Music Theory. I have performed at many prestigious events and venues both within the United States and internationally (Europe, Russia) as a soloist and chamber musician. In 2013 I recorded a piano and organ CD with Raul Prieto, the civic organist of San Diego, and with Brilliant Classics label at Palau de la Música Catalana in Barcelona, one of the greatest halls in Europe. I've been working as a piano accompanist for two years at Indiana University. I am mostly commited to classical repertoire but can be versatile and flexible with any kind of music comes my way. I have excellent sight-reading skills. This price varies on the difficulty of the music and how far I have to drive for rehearsals and performances.